The RT1650 provides I2C interface to communicate with external host device. Besides OTP firmware programming and MTP setting programming can be approached through the I2C interface, the external host can also communicate with the RT1650 to achieve more flexible applications. 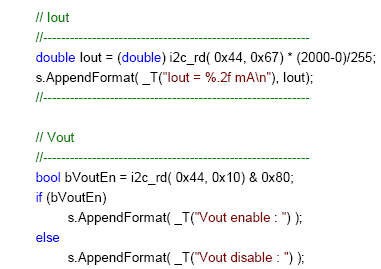 For example, the host can read the ADC information via the I2C Interface. The example code please refer to the annex A. Table 1 shows the specification of the I2C. Table 2 shows the RT1650 register definition. In addition, the I2C is used to read the internal status and the power source is from the VRECT. If the wireless function disable or in the adapter mode, the I2C can’t be accessed. e.g. : 1. If read the 0x7A data is 0xAA, 0x7B data is 0x21. The received power is 0x21 * 256 + 0xAA = 8618mW. 2. If read the 0x7A data is 0x55, 0x7B data is 0x91. This data should be ignore because the data is updating. RT1650 will update the ADC status of the VRECT, Vout and Iout before each CE packet and calculate the received power then updating the register before each RP packet. The time interval of each CE packet is 150ms and each RP packet is 1500ms. The time of the data updating is only few micro seconds. By the way, the RP function is using to detect the FOD for steady state. Figure 3. shows the 4 power transfer phases for the WPC v1.1. SELECTION : As soon as the Power Transmitter applies a Power Signal, the Power Receiver shall enter the selection phase. PING : The power Receiver should send the Digital Ping Packet to power Transmitter then into next phase. If not, the system shall revert to the Selection phase. The power Receiver also can send the End Power transfer Packet to stop the power Transmitter. 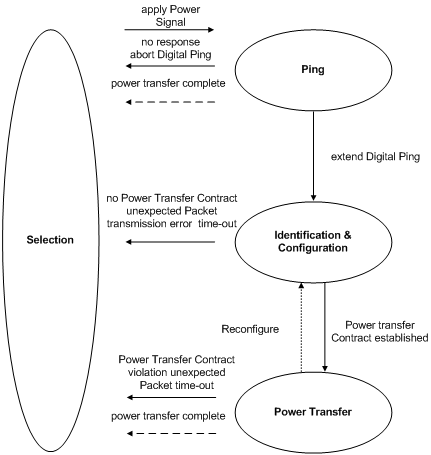 IDENTIFICATION & CONFIGURATIOIN : In this phase, the Power Receiver identifies the revision of the System Description Wireless Power Transfer the Power Receiver complies and configuration information such as the maximum power that the Power Receiver intends to provide at its output. The Power Transmitter uses this information to create a Power Transfer Contract. POWER TRANSFER : In this phase, the Power Transmitter continues to provide power to the Power Receiver. The power Receiver sends the Control Error Packet for adjusting the Primary Cell current. The Power Transmitter stops to provide power when the Received Power Packet is too low to trigger the FOD function or End Power Transfer Packet is sent from power Receiver. The RT1650 provides 2 input pins for operating mode control. The VIH of the Mode0 and Mode1 is 1.2V (min), VIL is 0.6V (max), shown as Table 4. Table 5 shows an example of operating mode control for wireless power and external adapter power. In default mode, both MODE0 and MODE1 are low, the wireless power is enabled and the adapter power has a higher priority. The wireless power is the normally operation, shown as Figure 4. 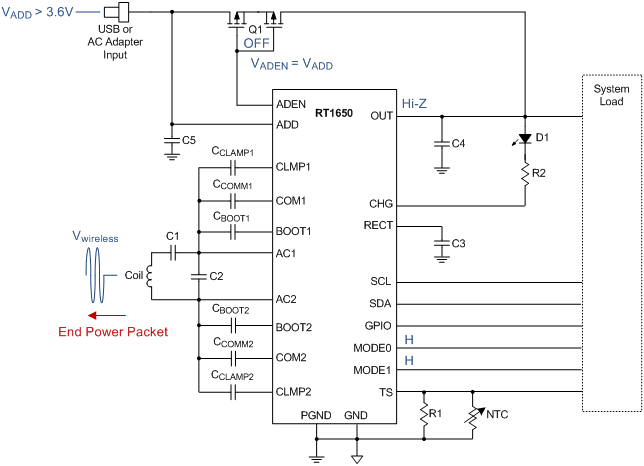 Once the adapter power is detected, the wireless power will be turned off and the ADEN will be pulled low to turn on the external switch for connecting the adapter power to system load, shown as Figure 5. When the MODE1 is pulled to high, the adapter power will be turned off by the external switch and enters wireless mode to allow wireless power operation only, shown as Figure 6. In adapter mode, the wireless power is turned off always and ADEN is pulled low to turn on external switch for adapter power, shown as Figure 7. In this mode, it allows an external charger operating in USB OTG mode to connect the OUT pin to power the USB at ADD pin, shown as Figure 8. If both MODE0 and MODE1 pins are pulled to high, the wireless power and adapter power are disabled, shown as Figure 9. (*)Note : If both adapter power and wireless power are present, adapter power is given higher priority. The RT1650 provides an external device thermal management function with an external NTC thermistor and a resistor connected between TS pin and GND pin shown as Figure 10. User can use this function to control the temperature of the coil, battery or other device. An internal current source (60µA) is provided to the external NTC thermistor and generates a voltage at the TS pin. The TS voltage is detected and sent to the ADC converter for external device thermal manage control. The thermal management function is shown as Figure 11. If the temperature is higher than Hot_temp or lower than Cold_temp threshold, the RT1650 will send the EPT to disable the power transfer. When the detected temperature increases and reaches the desired Regulation_temp, RT1650 will decrease the current limit to reduce the output current to regulate the temperature. When the detected temperature is lower than the Regulation_temp, the current limit will increase to the default value. This function is shown as Figure 12. The thermal management is programmable by MTP of each temperature setting. Figure 13 is the Control Panel of this function. Please refer to the following description for these item. Thermal Regulation check box : enable or disable all the thermal management function. 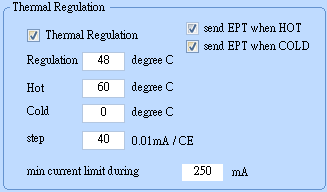 send EPT when HOT : Send the EPT to Tx when the temperature is higher than Hot_temp. send EPT when COLD : Send the EPT to Tx when the temperature is lower than Cold_temp. 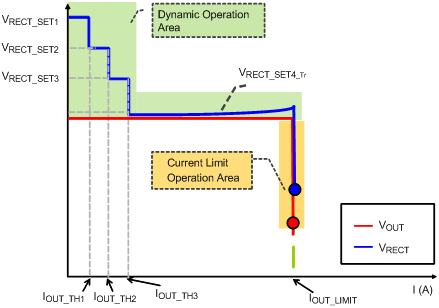 Step : The current limit reducing and rising step. The unit is 0.01mA/CE. The CE interval time is 150ms as default. e.g. If the value is 40, step is 40 x 0.01mA/CE = 0.4mA/CE. min current limit during : The minimum value of the thermoregulation. This value should be higher than 250mA. The NTC thermistor should be placed as close as possible to the device such as battery or mobile device. The recommended NTC thermistor is NCP15WF104F03RC (tolerance±1%, β = 4250K). 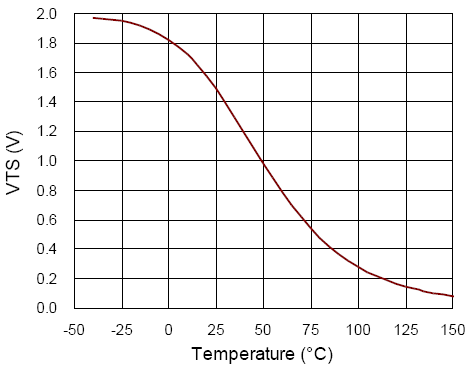 The typical resistance of the NTC is 100kΩ at 25degree. The recommended resistance for R1 is 33kΩ (±1%). 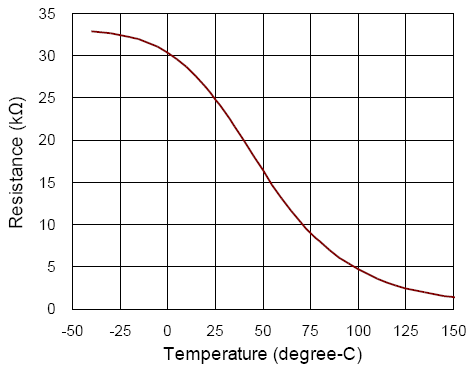 The value of the NTC thermistor at the desired temperature can be estimated by the following equation. 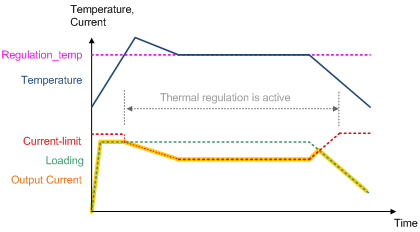 where TReg is the desired regulation temperature in degree Kelvin. RO is the nominal resistance at temperature T0 and β is the temperature coefficient of the NTC thermistor. Reg is the equivalent resistor of NTC thermistor in parallel with R1. 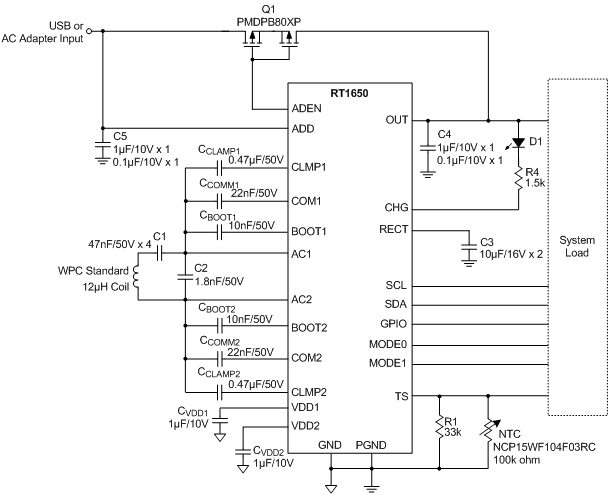 Figure 14 shows the equivalent resistance of the thermistor in parallel with R1 resistor varies with operating temperature. Figure 15 shows the VTS voltage with operating temperature. Customer can select the desire temperature and calculate the mapping data by the following equation. If the thermal management function is not used (RNTC = open), the resistor R1 = 24kΩ must be connected between the TS and GND pins. The RT1650 provides a programmable general purpose input/output (GPIO) pin. The GPIO can be used as an input or used as a status indicator for different application. Before use this GPIO, user should discuss its functions with RICHTEK and then RICHTEK code its function into firmware. GPIO can be push-pull or open-drain architecture when GPIO programmed as an output. The RT1650 is a WPC 1.1.1 compatible device. In order to enable a power transmitter to monitor the power loss across the interface as one of the possible methods to limit the temperature rise of foreign objects, the RT1650 reports its received power to the power transmitter. The received power equals the power that is available from the output of the power receiver plus any power that is lost in producing that output power (the power loss in the secondary coil and series resonant capacitor, the power loss in the shielding of the power receiver, the power loss in the rectifier). In WPC 1.1.1 specification, foreign object detection (FOD) is enforced. This means the RT1650 will send received power information with known accuracy to the transmitter. The received power is sensed as the Figure 16. The received power can calculate by the following formula. 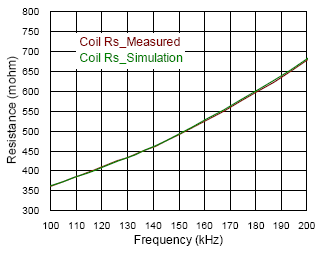 To use the GUI for the FOD calibration, the customer should measure the resistance of the coil from 100kHz to 200kHz and select the RX100, coefficient A and B to match the resister with frequency. The resister of the capacitor, RCS100, could be measure or get from the datasheet. If the customer can get the WPC certification transmitter, the Poffset can be selected for initial calibration. E.g. For this coil, we can get the A = 0.56, B = 0.32, Rx100 = 362mΩ, shown as Figure 17. RCS_100 = 150mΩ. Poffset = 100mW. Then use the GUI to set the parameter to MTP, shown as Figure 19. Please refer to the following description for these item. 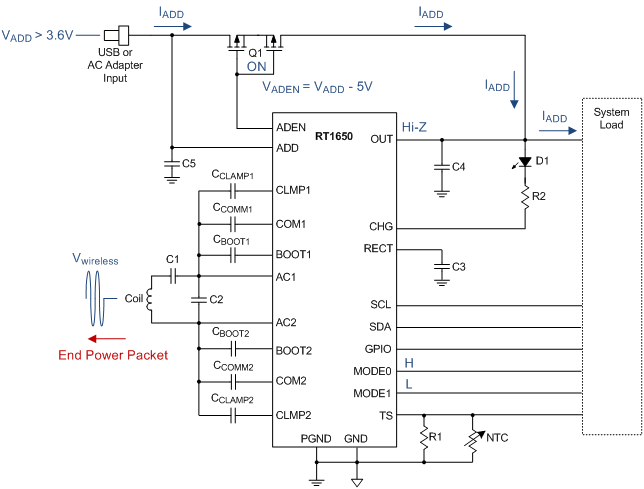 For the WPC 1.1.1 standard, a Power Receiver shall report its Received Power Preceived in a Received Power Packet such that Preceived – 250mW ≤ PPR ≤ Preceived. This means that the reported Received Power should higher than the actual Received Power PPR, by at most 250mW. RT1650 provide the rectifier efficiency and the resonant tank loss compensating to minimum the power offset between the transmitter and receiver and provide the power offset for FOD function. 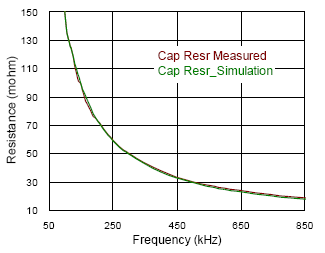 Figure 20 is the RT1650 FOD tuning flow. For the new model, customer should measure the parameter of the Rx100, CoeffA, CoeffB and RCS100 then setting to the MTP. 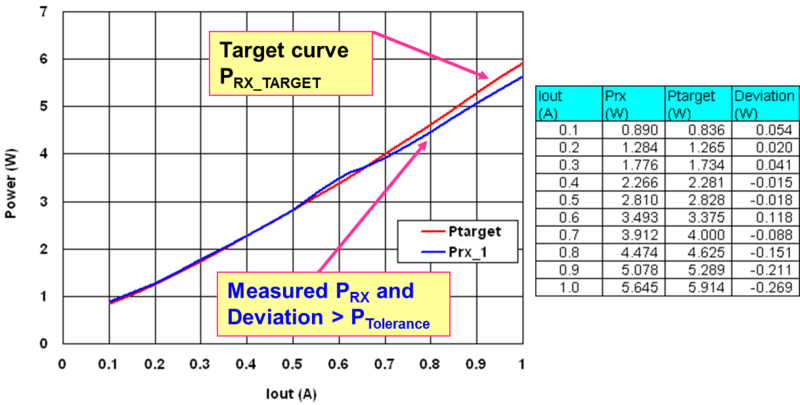 First step is that measure the PRx and PRxtarget by the FOD test jig, shown as Figure 21. 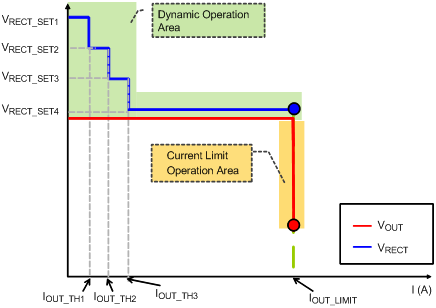 This step can observe the power offset of the initial state and the received power behavior. The second step that we should adjust the power offset to keep the 0≤ PRX-PTX ≤ 250mW at no load, shown as Figure 22. 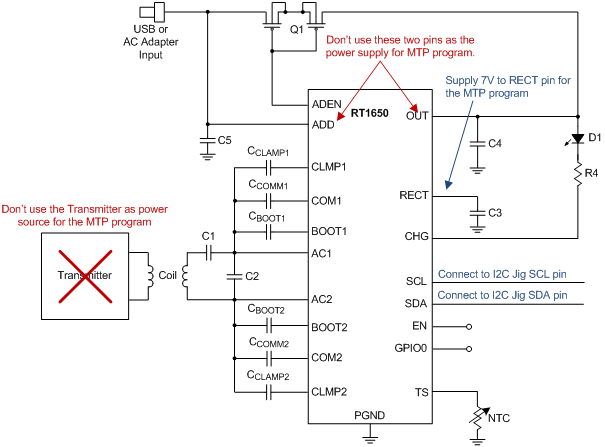 The third step is that check the power offset for heavy load and adjust Rx100 to minimize the power difference at heavy load, shown as Figure 23. The fourth step is that check the received power again. If there is any over spec, we can modify the rectifier efficiency to optimize the power, shown as Figure 24. The RT1650 supports battery charge complete detection function, shown as Figure 25. A programmable charge complete current threshold and a programmable charge complete detect time are provided. 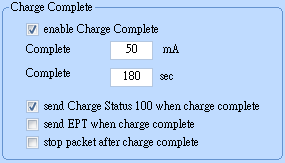 This function can be used to send the Charge Status packet to the transmitter for indicating a full charged status 100%. There are 3 operation modes when the charge complete status is detected, shown as Figure 26. 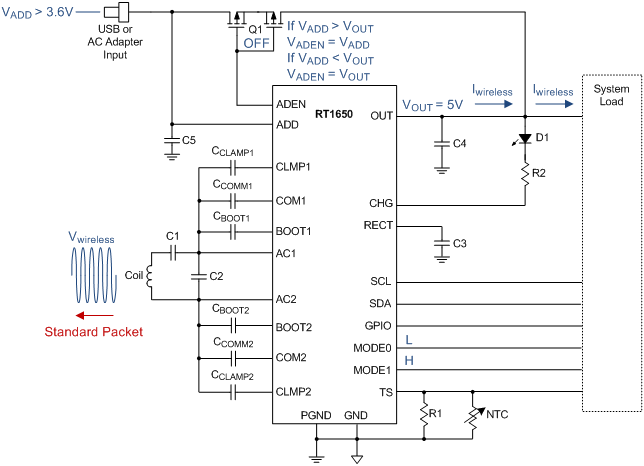 Mode1 is to send a CS packet to transmitter only. In the Mode2, the RT1650 will send a CS packet and an EPT packet to transmitter. 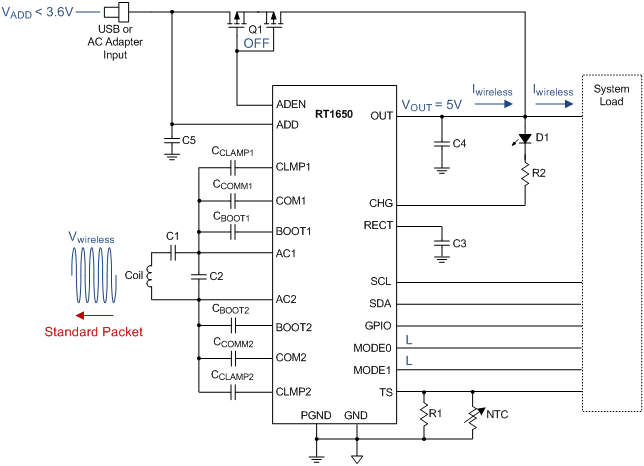 In the Mode3, the RT1650 will send a CS packet (0x05) then stop communication with the transmitter. The Charge Complete is programmable by MTP of each temperature setting. Figure 27 is the Control Panel of this function. Please refer to the following description for these item. enable Charge Complete : enable or disable the Battery Charge Complete Detection function. send Charge Status 100 when charge complete : Send the CS packet when Charge Complete. Enable this function for Mode1, Mode2 and Mode3. send EPT when charge complete : Send the EPT packet after CS packet. Enable this function for Mode2. stop packet after charge complete : Stop the communication after CS packet. Enable this function for Mode3. For the MTP program, please contact to the RICHTEK to get the GUI, test Jig and the driver. The standard program step is as following description. 1. Disable the Tx or remove the coil of the Rx from Tx. 2. Supply 7V and 30mA source ability at least to the RECT pin to GND. 3. Connect the SDA, SCL and GND pins of the test jig ”RT Bridgeboard” to PCB. The customer should install the driver “RTBridgeboardUtilitiesV130.exe” first. 5. Fill in the parameter. The component value and the maximum voltage rating is as following suggestion, shown as Figure 29. These value is selected based on the WPC standard transmitter and 5V adapter application. The customer should be modify by the customer design and application. The RT1650 provides a programmable Dynamic Rectifier Voltage Control function to optimize the transient response and power efficiency for applications. Figure 30 show an example to summarize how the rectifier behavior is dynamically adjusted based the VRECT_SET1~4 and IOUT_TH1~3, which are available to be programmed by MTP. The RT1650 has the VRECT tracking function for the higher efficiency application, shown as Figure 31. 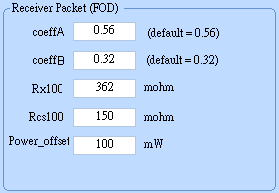 This function use the Iout to calculate the minimum drop-out voltage of the LDO to improve the system efficiency. This function also can tracking the rectifier voltage by the VOUT when current limit. To avoid the VOUT be clamped by the VRECT when the current limit released, RT1650 provide the tracking threshold parameter for the tracking function working. The Dynamic Rectifier Voltage Control is programmable by MTP. Figure 32 is the Control Panel of this function. Please refer to the following description for these item. enable Vrect Tracking : Enable Vrect Tracking function. Set the Vrect_4_Tr = Vout + Iout * R + Voffset. The Iout limit Control is programmable by MTP. Figure 33 is the Iout limit Control Panel. Please refer to the following description for this item. RT1650 have a detect function for loading is battery to avoid the reset fail. This function detects the Tx power then check the VRECT and VOUT status. If the Tx have no power, RT1650 will close the VOUT and VRECT. 1. Enable this function in MTP. 2. A LED and a 10kΩ resistor should be connected to the RECT pin and CHG pin. 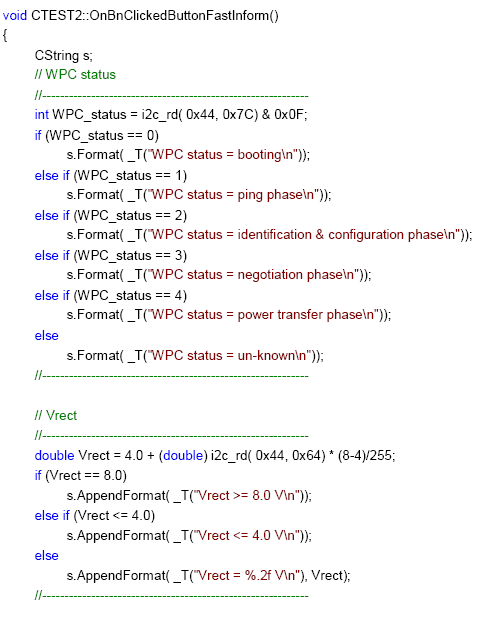 The communication of the WPC is the ASK modulation and the bit encoding scheme. If the check sum data send from Rx is different with the check sum value, Tx will ignore this packet. If the Tx can’t receive the complete packet in 1500ms, Tx will time-out and shut down. For the real system, the load may changes in the communication and that may let the data wrong. RT1650 provide the CE interval control function. 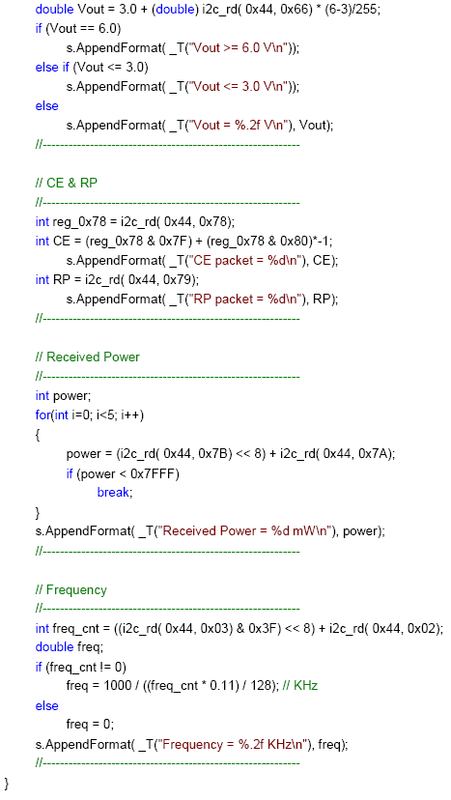 If the Iout change more than the threshold setting after the communication, RT1650 reduce the packet interval time to avoid the check sum error then time out. For marking information, contact our sales representative directly or through a Richtek distributor located in your area, otherwise visit our website for detail.